Dubai : ‘A complex shoulder replacement surgery performed at Thumbay Hospital – Dubai has helped a Pakistani truck driver return to work after 6 months of post-op rest and recovery. The 42-year-old truck driver, Jahanzeb Khan Muhammad Siddique, who was at the hospital last week for his check-up, has been declared fit by his surgeon to return to his normal life and resume his job. It was on 14th April 2017 that Jahanzeb was brought into the Emergency Department of Thumbay Hospital, Dubai, following a road traffic accident while on duty. He was experiencing severe pain in his right shoulder. The debilitating shoulder joint pain caused by a severe comminuted shoulder joint fracture brought a nightmare to the patient and to the surgeon. His high body weight of 156kgs and BMI of 54.67 posed an additional challenge to the doctors. The challenge before the doctors at Thumbay Hospital was to save the patients shoulder so that the truck driver could return to his daily lives and resume his livelihood. As an expat, Jahanzeb knew that if his shoulder didn’t function normally, he would not be able to return to his heavy motor driving job or any other job, which would eventually force him to leave the country. The team of specialized surgeons at Thumbay Hospital - Dubai, headed by Dr. Rajesh Garg (MCh, MS; Specialist Orthopaedic Surgeon, Thumbay Hospital, Dubai) took up the challenge and after preparing the patient for shoulder surgery, performed replacement of the right shoulder on 23rd April 2017. Dr. Rajesh Garg, with his international expertise, has successfully performed more than 3000 joint replacements surgeries in India and the UAE. “Starting from the size of the OT table, positioning the patient on that table and general anesthesia itself was a challenging task in the case of this patient, all thanks to his weight. 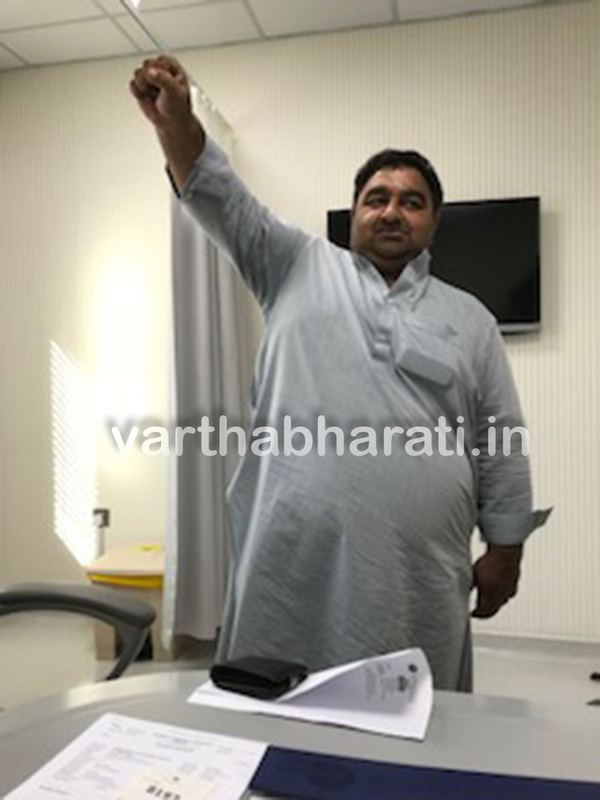 We took almost 4 hours, which is double the usual time taken for the surgery, to give him a successful new shoulder joint,” said Dr. Rajesh Garg. “By performing this surgery in spite of the challenges it posed, we have once again demonstrated our commitment to the goal: journey of each patient to full independence,” Dr. Rajesh Garg said. The Ortho Spine center at Thumbay Hospital - Dubai offers expert care in the following areas: Total Joints Replacement and Revision, Arthroscopic Surgery, Sports Related Injuries, Pediatric Orthopedics, Orthopedic Fractures and Trauma (Adult & Children) and Spinal Surgeries. Equipped with trained surgeons who specialize in orthopedics and spine procedures, the specialized center also offers outpatient services. Orthopedic services including surgical procedures are provided 24 x 7. The Thumbay network of academic hospitals is now the largest network of private academic hospitals in the Middle East, treating patients from around 175 nationalities. It is also one of the biggest JCI-accredited private academic hospital networks in the region. Thumbay Group’s healthcare division also operates a chain of family clinics (Thumbay Clinic) and multispecialty day care hospitals (Thumbay Hospital Day Care) in the UAE as well as diagnostic labs (Thumbay Labs) and pharmacies (Thumbay Pharmacy) in the UAE and India. The hospitals and clinics are presently located at Dubai, Ajman, Sharjah, Fujairah, Ras Al Khaimah and Umm Al Quwain in the U.A.E. and in Hyderabad—India. Thumbay Medical Tourism, which promotes Thumbay Group’s ultra-modern healthcare services to international patients, is tied-up with 87 countries through representative offices. According to Thumbay Group’s strategic plans, the Thumbay academic hospital network will have a total of 1000 beds in the UAE, 1500 beds in India and 750 beds elsewhere in the Gulf and Africa by 2022. ಮಗುವನ್ನು ನಿಲ್ದಾಣದಲ್ಲಿಯೇ ಮರೆತು ವಿಮಾನ ಹತ್ತಿದ ಮಹಿಳೆ! ಸಾರ್ವಜನಿಕ ಸಾರಿಗೆ ಬಳಕೆಗೆ ಸ್ಮಾರ್ಟ್‌ವಾಚ್ ಉಡುಗೊರೆ!